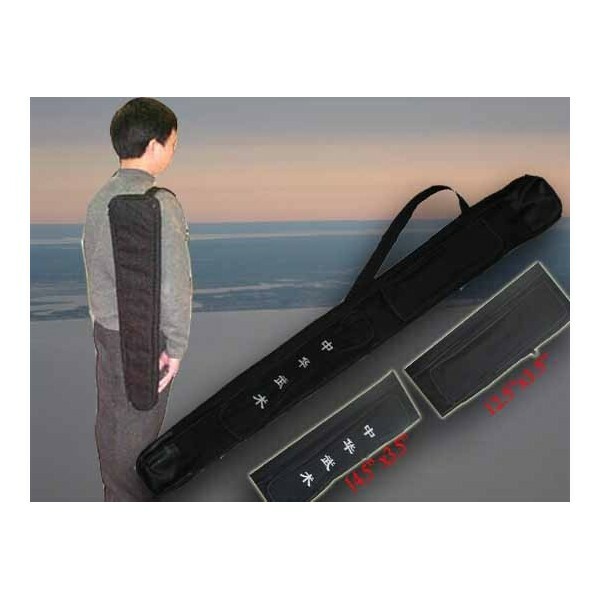 Weapons Carrying case 45"x4.5"--sword/broadsword - Bok Lei Po Trading Inc. This weapons case can carry Straight Sword,Broadsword and it is made of durable canvas.Zipper closure from left to right makes you easy to putting in and taking out of your sword/broadsword,adjustable shoulder strap, special design to fit your two straight swords or a broadsword in the case. there are two small packets, their sizes are 12"x3.5" and 14.5"x3.5" , you may put your fan or some other small items. the Chinese characters on the lower pocket means "Chinese Wushu (Zhon Hua Wu Shu). the total length of the carrying case is 45 inches and the width is 4.5 inches.